Former Secretary of Transportation William T. Coleman, Jr., passed away on March 31, 2017. He served as Secretary from March 1975 to January 1977. Born in Philadelphia, Coleman was an attorney who worked with Thurgood Marshall of the NAACP's Legal Defense Fund on many desegregation cases. In 1954, Coleman worked closely with Marshall as he prepared arguments before the Supreme Court in Brown v. Board of Education. The court's landmark decision declared "separate but equal" unconstitutional for education and, more broadly, throughout our society. In the 1960s, he was a staff lawyer for the Warren Commission on the assassination of President John F. Kennedy. There, he impressed Representative Gerald R. Ford, a member of the Commission, who remembered him years later when, as President, he was looking for a new Secretary of Transportation. President Gerald R. Ford (left) looks on as Supreme Court Justice Thurgood Marshall administers the oath of office to his friend and colleague, William T. Coleman, Jr., as Secretary of Transportation. 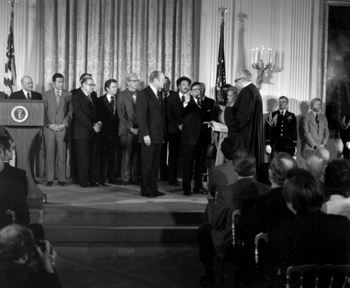 On March 7, 1975, President Ford attended the White House ceremony as Supreme Court Justice Thurgood Marshall administered the oath of office to Coleman as the fourth Secretary of Transportation. The 54-year old attorney would be the second African American to hold a Cabinet post (the first was Robert C. Weaver, Secretary of Housing and Urban Development from 1966 to 1968). Coleman had extensive experience in transportation, including serving as legal counsel for Cincinnati and Philadelphia as they acquired their private transit systems and as special counsel for SEPTA, the Philadelphia area transit agency. At the time of his nomination, he was a director of Pan American World Airways. Although Secretary Coleman was involved in all aspects of DOT's activities, we are most interested in his role in FHWA issues. In his excellent 2010 autobiography, Counsel for the Nation: Shaping the Law to Realize America's Promise (written with Donald T. Bliss), he wrote of the environmental battles that were blocking many Interstate projects, especially in cities. "I made the completion of the Interstate System a high priority. We would work through the environmental issues and decide on alternatives that would meet environmental objections and withstand judicial scrutiny." 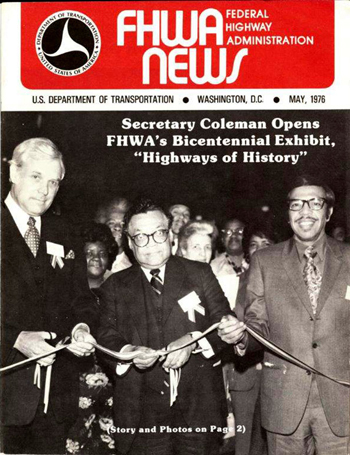 The March 1975 issue of FHWA News informed the agency that William T. Coleman, Jr., was the new Secretary of Transportation. As Kevin E. Heanue, who retired as FHWA's Director of the Office of Environment and Planning, recalled of Secretary Coleman's arrival, "FHWA had a large backlog of controversial projects held up in OST because of environmental concerns. He approached the backlog as a judge would. He took them on one at a time and made decisions on the facts at hand. Some were approved and some denied." For example, he became directly involved in several Interstate disputes, but perhaps the best known was the logjam on Virginia's I-66 inside the Capital Beltway. Objections from citizens groups and Arlington County officials had locked I-66 in controversy and in court for years. "On June 21, 1975," he wrote, "I held all-day public hearings and heard arguments by election officials and organizations both for and against the proposal." His decision on January 5, 1977, approved a four-lane I-66 with Metro rail in the median. It would serve only HOVs in the direction of peak traffic in the morning and afternoon, exclude heavy duty trucks at all times, and be designed in a way that made widening virtually prohibitive. As noted in his book, the decision was hailed as "a wide and forward-thinking view of national transportation policy, recognizing the need for alternatives to the automobile and highway construction." After it opened on December 22, 1982, the limits of forward thinking became evident as it quickly became one of the area's transportation chokepoints. Having moved to Alexandria, Virginia, after leaving office to work with the law firm of O'Melveny and Myers, he was aware of the search for ways to keep traffic moving in the corridor. Nevertheless, he thought his approach was valid. "We cannot simply build highways willy-nilly. We need coordinated regional transportation plans that preserve the quality of urban life, conserve energy, and reduce air pollution, including that from the new threat of greenhouse gas emissions." Those of us who were in FHWA Headquarters at the time will recall Secretary Coleman's last days in office. He made a circuit of every floor of Headquarters to thank employees for their support. After his office alerted a floor of his arrival time, employees waited in the halls to greet him with handshakes, hugs, and a few kisses. I am grateful for the American people, who, sometimes begrudgingly and not always peacefully, have nevertheless generally come to accept that the promise of America's dream will be realized only when all of its citizens are able to participate fully in democratic self-government and a competitive, dynamic, free economy. 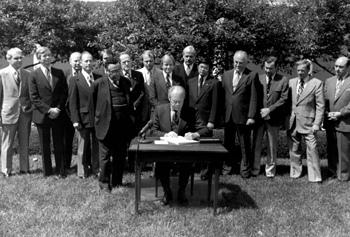 Signing Ceremony: Secretary of Transportation William T. Coleman, Jr., looks on as President Gerald R. Ford signs the Federal-Aid Highway Act of 1976. It established the Interstate 3R Program (resurfacing, restoring, and rehabilitating), creating a "Transition Quarter" as the Federal Government shifts the start of the fiscal year from July 1 to October 1, revising the Interstate withdrawal/substitution provision of the 1973 Act to allow substitute highway as well as public transportation projects. Immediately behind the President are Representative Norman Y. Mineta (CA), a future Secretary of Transportation (over the President's left shoulder), and Federal Highway Administrator Norbert T. Tiemann (behind Mineta). 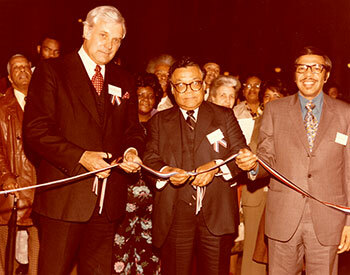 Cutting a Ribbon: Federal Highway Administrator Norbert T. Tiemann (left) and The Reverend Jerry Moore (right), a D.C. City Councilman, hold the ribbon as Secretary of Transportation William T. Coleman, Jr. open the Bicentennial Exhibit "Highways of History" on March 31, 1976, in the Old Pension Building (now the National Building Museum). 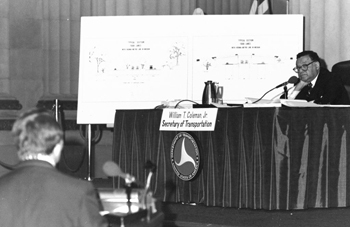 Public Hearing: Following a public hearing on June 21, 1975, Secretary of Transportation William T. Coleman, Jr., rejected the six-lane version of I-66 between the Capital Beltway and Washington, D.C. On October 2, 1976, he held a second hearing to consider whether to approve a four-lane version of the highway. 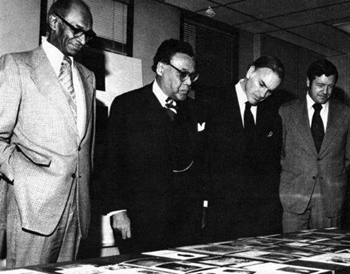 Viewing an Exhibit: Shortly after taking office, Secretary William T. Coleman, Jr., viewed FHWA's Black History Exhibit with Alexander G. Gaither (left), Director, FHWA's Office of Civil Rights; Deputy Secretary John W. Barnum; and FHWA Executive Director Lester P. Lamm (right). Turning to Deputy Secretary Barnum, Secretary Coleman said, "John, we are going to make DOT the best Department in the entire Federal Government." Secretary Coleman was enthusiastically applauded.